Reporting from Korea is getting to be really, really exciting as Koreans have begun to seriously embrace 3D printing. We recently found a sleek little desktop printer manufactured by a company called HyVision. We had heard their name tossed about at trade shows and maker meetings, but didn’t really know much about them. The company was founded in 2002 and is based just south of Seoul. Since their founding their primary business has been the production of CCM (Compact Camera Module) testing machines used by some of the biggest electronics companies, to check the camera component on various applications, especially cellphones. Their English language website can be found here, where you can learn more about them and their history. Back in 2013 they began to explore 3D printing, and started an intensive in-house design program to develop their own unique machines using the knowledge base acquired building precision 3D movements for their CCD testing equipment. They released their first production printer, the Cubicon Single, in July of 2014 which was aimed mostly at small and medium sized design firms. Their recently released second model, the Cubicon Style, is clearly aimed at the consumer market as its design, size, price, and most importantly…ease of use, fit nicely into that category. Learning that their machines were some of the very first to integrate a fully sealed air filtration system, we called them to see if they would be interested in letting us do a review. What we found blew us away! Simply put, the Cubicon Style is the most amazing desktop printer we have used to date. Technology will continue to march forward and newer and better designs will continue to emerge, but for now, compared to all currently produced models this one beats them all. While the review that follows will sound gushing at times, it is all true and factual, based on an ordinary office setting usage over the span of a single month. Anyone who has even a passing familiarity with FDM-style desktop printers knows of their most irritating, and common, issues. This machine does away with all of them…no fooling. We will go through the list one by one and explain how this machine ticks off every box on our “user’s wish list”. It is as absolutely as close to the fabled “microwave simple” standard we have all been waiting for as I have yet seen. What do we mean by that exactly? Let us explain. First, the “sticking” problem. We have all had to deal with models not adhering to the build plate properly, so we experiment with hairspray, glue sticks, acetone slurry, or whatever. I love trying out new techniques and stuff…but not this basic stuff! The Cubicon Style uses an aluminum build plate that has a proprietary black coating on it that looks like a heavy black anodization. It works well…really well at keeping your models stuck in place during the build process, and then effortlessly, literally effortlessly, releases them after it has cooled down. No more Kapton or painter’s tape, no more glue, no more scrapers, or broken prints. When it is finished, just reach in, pick up your model, and remove. Second, bed leveling. Though most quality machines now have an auto-leveling feature, even the best doesn’t always work perfectly. Well, now this is resolved. The Cubicon Style’s auto-leveling system not only checks the level of the buildplate before each and every print, but actually continues to check the level of the plate during the build itself! The patent pending buildplate mechanism makes micro-adjustments to keep each and every print perfect. According to the company, their system, called the Auto Leveling Plus, “helps automatically level the space between the nozzle and the bed in the printing process. It keeps the bed level all the time by moving both the X axis and the Y axis. By doing so, it can improve the precision of the output by making sure that the gap will not widen in the printing process or peel off, or the stacking position will not become irregular.” Big claims, so we tested by printing a 15cm cube and all four sides were perfectly vertical. Third, heat control. The Cubicon Style uses an entirely enclosed build chamber. Inside the sealed case, it uses a convection system to evenly distribute heat throughout the build chamber which reduces warping and splitting. Printing temperatures can go up to 260°C; and the heated platform can go up to 120°C. At 15 x 15 x 15 cm the build area is fair, and the printer’s resolution ranges between 100 microns and 300 microns, and can print at up to 300mm per second. Access to the interior of the machine is from the front mounted door, and a dome shaped lid on the machine’s top. The convection feature also quickly lowers the internal printer temperature after the print is completed to allow you to remove your model faster than a more traditional glass buildplate. Fourth, the Cubicon Style is one of the very few printers that has a truly removable extruder. And based on my experience, one group that will want to have an extra extruder available are teachers. As a teacher who uses a 3D printer in class, I can tell you there are few things more disruptive to a class lesson than equipment failure. Having an extra extruder on hand, even if it is never used, is a really nice feature. The Style’s extruder, the first of its kind in Korea, takes under 1 minute to change out using only a standard screwdriver and an Allen wrench. And while the Style’s extruders are a little more expensive than the now infamous disposable “smart” ones made by another company, you won’t have to buy a new one after every 150 hours of printing. Fifth, noise. The sealed case also keeps the noise down…way, way down. The company states that the Cubicon Style is under 50 decibels, but my (unscientific) measurements came out far lower than that. At 6 inches from the machine, while in full operation, my decibel meter registered only 35 decibels…which is the level of ambient noise you would expect in a library! I discovered this attribute by accident when I started my very first print. I loaded the filament and Gcode files, hit the start button, and went back to my desk to wait for the printer to warm up and start, so I could watch the first few layers being laid down. After about 20 minutes, I had not heard the stepper motors moving and thought, “…oh, damn the printer hasn’t started.” I went to check and found that it was one-fourth of the way through the print job! Sixth, the software. Most machines today use some form of an open source slicer. HyVision does too, but with a twist. The Cubicon Style uses a modified form of Cura, which many know already comes with a host of great features, but the HyVision version goes further and improves on it. 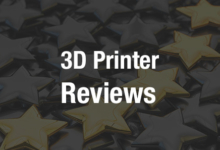 Our favorite slicer is Simplify3D, which is in our opinion the gold standard as of now. Cura is good, but clearly not as flexible as Simplify3D, so imagine our surprise when we discovered that HyVision has integrated a customizable support option of the type that we love from Simplify3D into their version of Cura. Being able to choose where supports go is an amazing feature. The program also gives you the option of printing out detailed reports on each print project…for future reference. Overall the machine is a beauty! In fact we just learned that the Cubicon Style has won the “Red Dot” award for design excellence, which really came as no surprise. It is a very attractive machine that quite literally would look at home not just on your desk…it would like right at home in your living room (though I wouldn’t recommend that). The Style’s overall size is a compact 32.2 cm wide, 35 cm deep and 48.6 cm tall, and it weighs about 15.5 kilograms. It has a solid black anodized aluminum frame for rigidity, and a darkly tinted, transparent case for easy viewing of your build. While the machine is printing the printer’s internal LED lighting illuminates the interior so that the build process can be watched from all angles, except the back which is made of solid aluminum. At $1700.00, the price is more than reasonable for what you getting. The Cubicon Style is the new yardstick by which we in our lab will be judging all other desktop printers. If you are a teacher or parent, a small business person, a hobbyist designer, or anyone who is looking for a printer that you do not have to constantly babysit and tweak just to get it to work like it should, a machine that has all the built in safety features currently available, this is your machine! HyVision will be at the Inside 3D Printing show in New York this month, so go there and check them out at booth 215. They told us they will have the Single, the Single Plus, the Style, and their brand new Lux, a desktop DLP machine, with them there for everyone to see. Seriously, check them out and test them, you will be as impressed as we are. Though we get to test and play with different 3D printers all the time, this is one that we would actually buy…which we can in the US starting this May.